K2840 SwimPro4Cam. Komplett foto ur 4 vinklar, kopplas ihop wireless och du kan titta på det inspelade i Ipaden, telefonen eller på storbilds skärm. K2840 SwimPro4Cam är ett komplett högkvalitativt system med 4 filmkameror och digital överföring, som ger möjligheten att i realtid, medan simmaren fortfarande simmar, i smatphone, på plattan eller ex en 60" TV-skärn samtidigt se simningen ur 4 synvinklar. Kamerorna kan placeras över eller under vattenytan. Var och en av de 4 kamerorna kan användas separat eller i en mindre grupp på t.ex. 2 kameror. I SwimPro4Cam ingår 4 undervattenkamror, en router för wireless överföring, samt en special videospelare med ett analys program, där du har möjligheten att mäta i tid och vinklar, rita och förklara samt möjlighet till inställning för 10 sek försenad filmvisning. I SwimPro4cam ingår också 3 vaderade transportväskor för kamror för säker transport av filmutrustningen. All angles + all training applications covered! 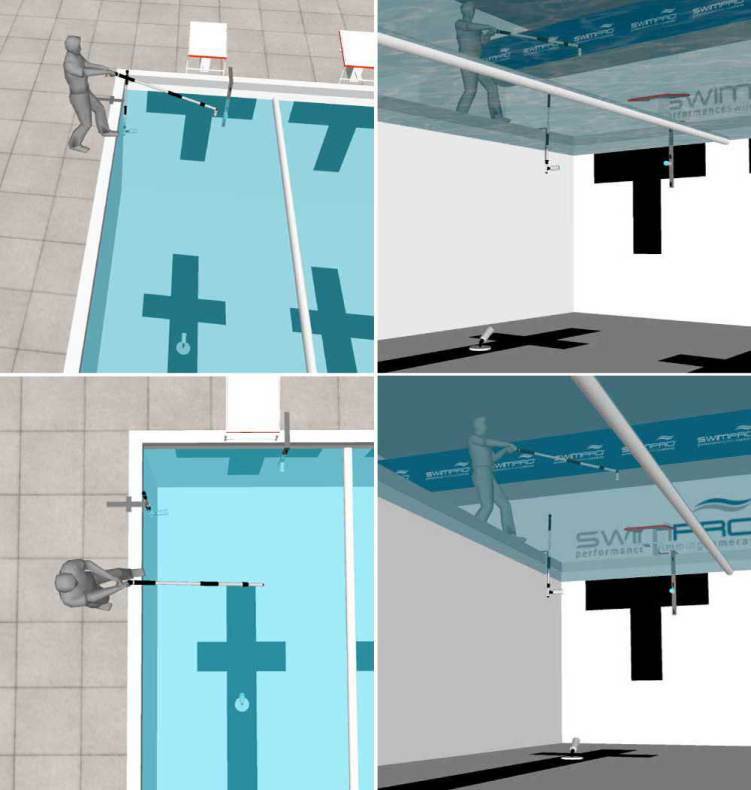 The SwimPro 4Cam system leads the world in swimming training technology. Imagine viewing an athletes stroke & style from 4 different angles! Even established coaches are finding the benefits of the 4Cam system are surpassing their expectations. Even though swimming techniques may look good from the surface, the SwimPro 4Cam can expose many technical flaws with the use of multiple underwater angles. Australian 100m freestyle world champion and London Olympics gold medal favourite James Magnessun uses SwimPro to instantly review his stroke & style, helping him become the best of the best. SwimPro 4Cam Systems are an an integral part of his everyday training and success. The SwimPro 4cam package enables you too choose a combination of SwimPro training cameras while recording with the full DVD quality SwimPro 2000GB 4Cam Recorder, all whilst streaming live onto one screen (split into four). This enables you to analyse technique from 4 separate angles, play the recording back later and/or download them to a USB Thumb Drive or External Hard Drive. SwimPro 4Cam covers it all. Combining the power of 4 flexible camera packages (Platinum Plus, Pro X, Basix & FloorCam), 4 different camera angles (above and below water) and the iPad + pool-deck instant software analysis ability. Pioneering the way in world swimming coaching, this package will give you and your swimmers the edge! Applications are endless! This package was designed to offer flexibilty, portability and cover all angles above and below water and it doesn't stop there. 4 cameras connect into our SwimPro IQ Recorder where instant pool-deck video analysis can be executed. And more ? Purchase our brand new Swimpro iPad App from the App Store and you will have the analysis power in your hands (including delayed playback and drawing on screen). Check it out here..
iPad Wireless Connectivity - NEW ! !